If you are organising a baby shower party, then our baby shower presents, rosettes and baby shower sashes are very popular accessories. You could decide to buy them for just for the new mum-to-be. You may decide that they should be for all the guests at the party. There are an inexpensive addition. Yet they have the effect of creating a great party atmosphere and showing your support for the happy event. Whatever you decide upon, then we are sure that we can help you. We can provide you with a top quality product to complement your special occasion. You might be arranging a party, and you already know whether it is a boy or girl. If so then we have pink or blue rosettes. If it’s a secret or a surprise then there are several options. A neutral colour – like purple, white or a pastel colour. Or if we are just talking rosettes, then how about a double tiered rosette- one layer pink and one blue. The colours of the rosette are entirely up top you. Choose the one that fits the party theme. There are several designs that we have for the centres of the rosettes.Just choose your design and wording and leave the rest to us. You can change the colours of the centre if you wish. 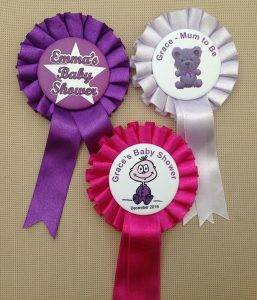 If required then we can also print a message on the tails of the rosettes to add that extra element of personalisation. If you want a sash instead or as well then we have baby blue, baby pink as well as the more intense colours of ribbon, Print colour and wording is up to you – black, silver metallic or gold metallic foil. 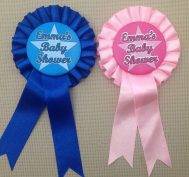 We can also provide the same designs ythat are shown as rosette centres, as baby shower badges. 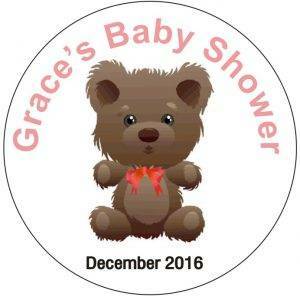 As with the rosettes, just choose the design that you require and let us know the personalised wording that you want to add to your badges. On our other sites we also have a great selection of baby shower presents, Christening gifts and gifts for the new baby.